This class is a wait-and-see sort of thing. We won't know if these late pickups were players RR and other Big Ten schools misevaluated or warm bodies for a while, and we won't know about Hoke's recruiting prowess until the 2012 commits start rolling in and he's competing against Ohio State. Not that Rodriguez won many battles against OSU. In the short amount of time that Hoke had, he was able to retain the majority of Michigan's committed recruits and add a few 3-star types to the class to fill out the depth chart and possibly find a serious contributor down the line. With the exception of 4-star tight end Chris Barnett, Hoke's haul was unexceptional, but expecting more than that was asking too much: the guy had a month to introduce an entirely new culture to a team, maintain the old regime's current commits (and players), and find ones of his own. I am still disappointed with this class, though, primarily because of what it could have been had Rodriguez still been around. Thinking back to the Army All American game and watching Kris Frost and Dee Hart both mention Michigan's coaching situation as a negative is still bothersome. Adding Dee Hart, Kris Frost, Jake Fisher, Wayne Lyons, and Avery Walls (or a majority of them anyway) to Rodriguez's committed foundation would've been the makings for his best class since coming to Michigan and would've addressed several needs. But harping on this too much is a waste. I was one of the many that was upset with the Hoke hire, but since then, things have gone about as well as anyone could've reasonably expected: there has been zero attrition from the team, the committed recruits mostly stuck around and Hoke was able to fill the rest of the class with down-the-line contributors, and Michigan has hired at least one stud coordinator--and apparently, a great recruiter to boot--to remedy the team's greatest weakness. So now we enter the dead period until spring camp starts again in March and April. Stock up on supplies. It's going to be another long offseason. 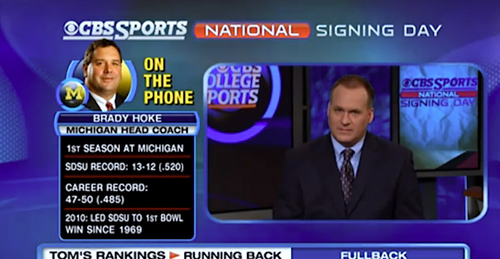 I agree generally, but I don't really think Hoke did a good job. This is the lowest ranked Michigan recruiting class in the 10 years since they've been publicly listed (rivals and scout data goes back to 2002). Its the first class ever to be ranked outside of top 25 (to scout and espn, but not rivals - 21 there). You can blame this on Brandon and the process if you want, but the bottom line is that Hoke lost a head-to-head battle for Fisher with Oregon with an in-state kid that had previously been committed, at a position of extreme need, and in a class that had no other pure OT recruits (compared to Oregon's which already had a couple of very highly rated OTs). The way the Frost situation was handled was also a debacle. Its hard not to see how Hoke shouldn't have done more to retain him. I'll give him a pass on filling out the class with 3-stars - under the circumstances, that was good, but there should have been more effort placed into landing an elite FS or finding serviceable OL and DT prospects, even if they were MAC-caliber. There was no Plan B for Fisher and Cooper (who never seemed real likely anyway). I agree we can't really pass judgment till the 2012 class but 2011 doesn't make me feel real optimistic about it.